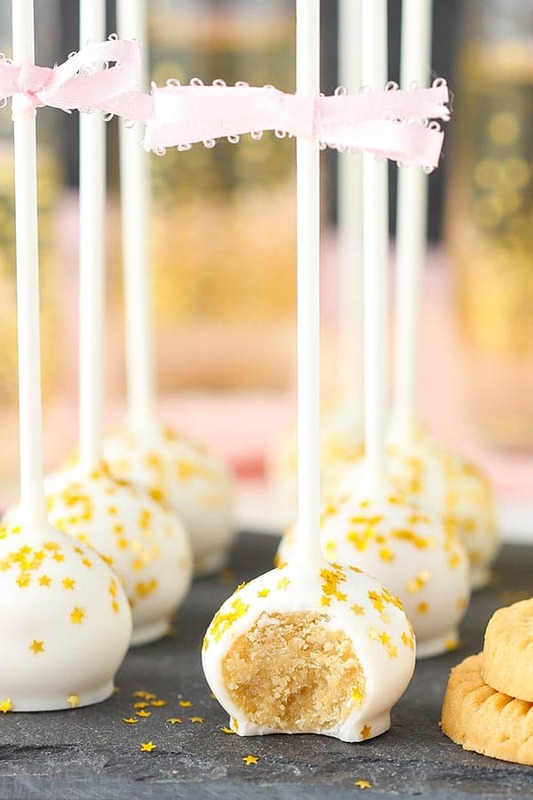 These Champagne Cookie Balls are no bake, easy to make and super fun! 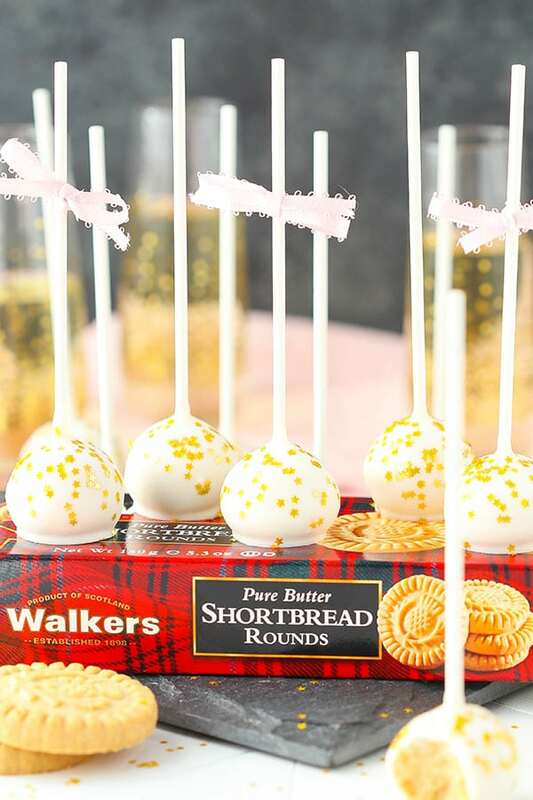 They make such a wonderful little treat with the buttery taste of Walkers Shortbread and champagne! Second, Walkers Shortbread. Seriously the best shortbread around. 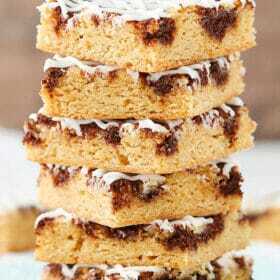 I used their shortbread rounds in these pops (I consider those the “classic” shortbread) and they are the jam. So buttery! Shortbread is naturally more crunchy, but these are so buttery they just about melt in your mouth. Love them! All the varieties are awesome. And finally, they are no bake. I’m always a fan of no bake. So what are we celebrating? Anything! You tell me! However, there are also some fun things to celebrate coming up. One is love on Valentine’s Day, the other is award show season. 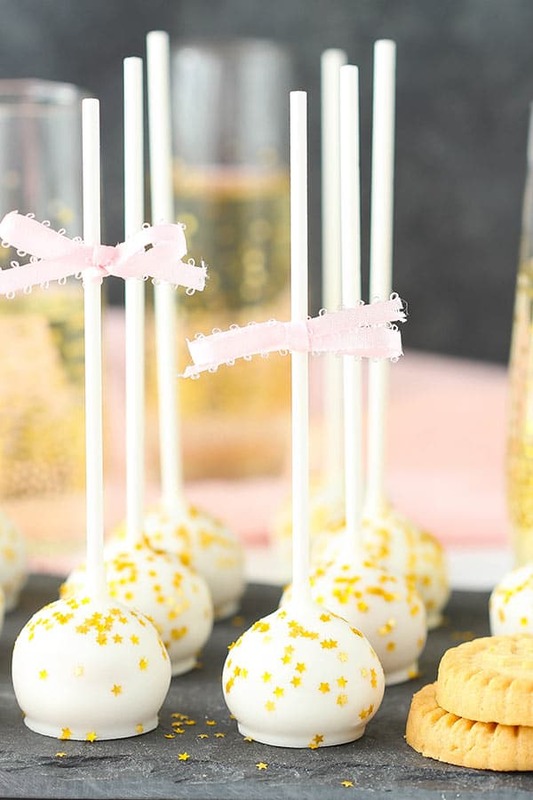 What better to do than hang out with champagne pops and watch the red carpet? So let’s talk a bit about how to put these beauties together. To start, you want to create a champagne reduction. Don’t be afraid, that’s really just fancy talk for heating up the champagne so that you make it more concentrated. We want to be careful not to add too much liquid to the pops or they won’t stick to the lollipop sticks. But we also want plenty of champagne flavor. So to satisfy both requirements, the champagne is just heated over the stove until it’s reduced by half. You literally don’t have to do anything except watch it to make sure it doesn’t boil. Once it’s reduced, let it cool. From there, grind the shortbread into crumbs with a food processor. Add some powdered sugar and combine them well. To that mixture, add the cooled champagne and corn syrup. The champagne obviously gives flavor and the corn syrup is nice and sticky and helps everything come together and hold it’s shape. 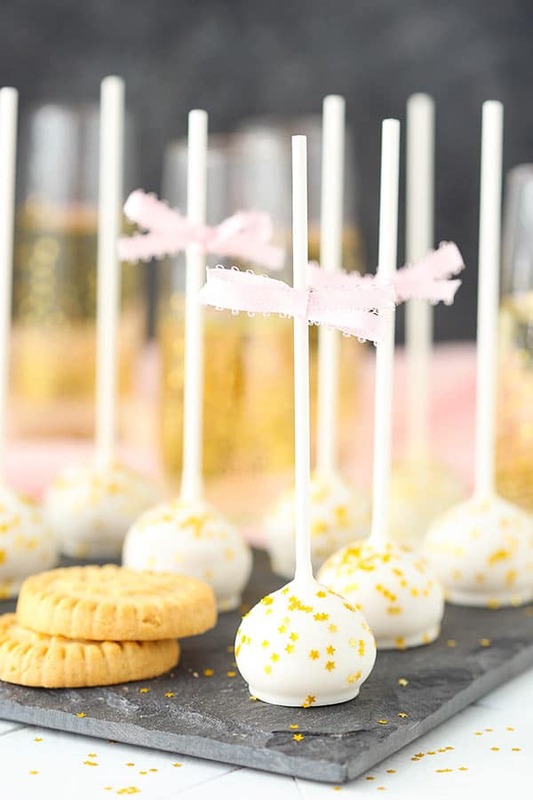 These little pops are so dang cute and can be made for any occasion. They transport super well and could be decked out with any kind of sprinkles. 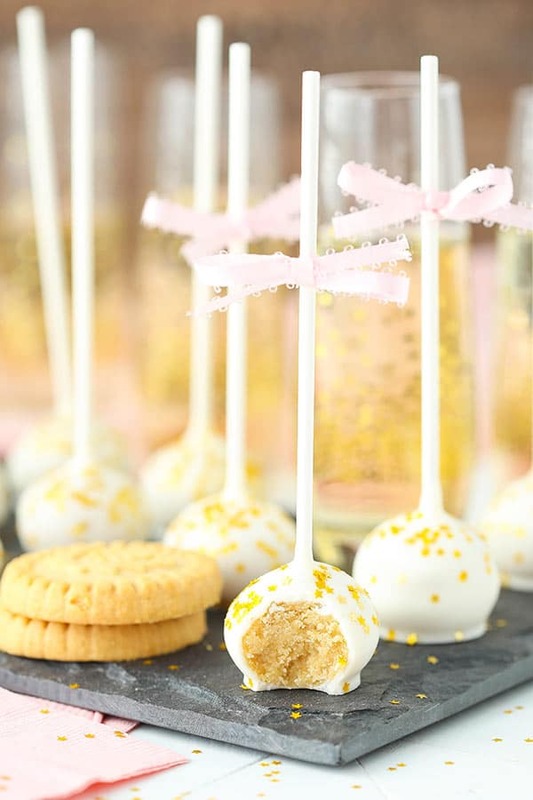 The sweet buttery flavor of the shortbread with the champagne is wonderful! I hope you enjoy them as much as we did! 1. To reduce the champagne, add the champagne to a medium saucepan over medium heat. Heat, stirring occasionally, until the liquid has been reduce by half, to 1/4 cup. Do not boil. To see if the volume has reduced enough, pour the liquid into a glass measuring cup. If not yet at 1/4 cup (60ml), pour champagne back into the pan and continue to heat until it has. Once done, set aside to cool and come to room temperature. You can place it in the refrigerator or freezer to speed up cooling. 2. Combine the shortbread crumbs and powdered sugar in a large bowl. 3. Add the corn syrup and cooled champagne reduction and mix well. Mixture will be moist but slightly crumbly. 4. 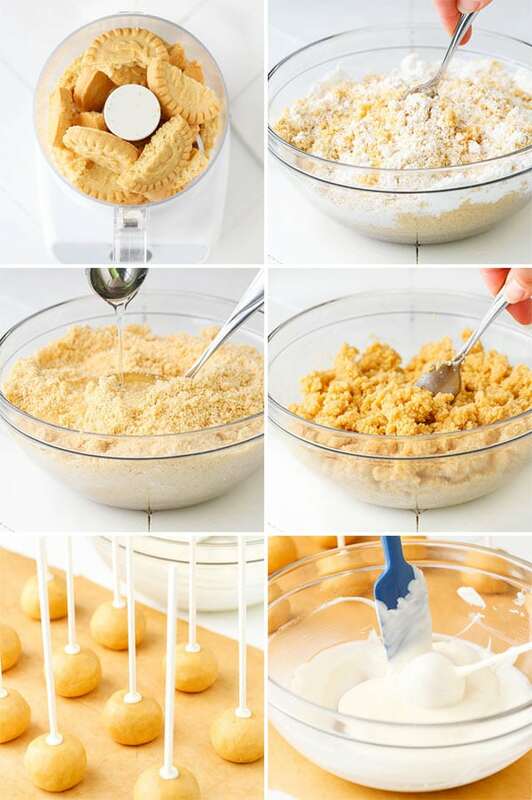 Make balls of about 1 1/2 tablespoons each of the shortbread mixture. Shape balls and set aside. Mixture might become more crumbly as it sits. You can add an additional 1/2 – 1 tsp of champagne, as needed, to help the mixture stay moist. 5. Melt candi quick in a bowl according to package instruction. 6. 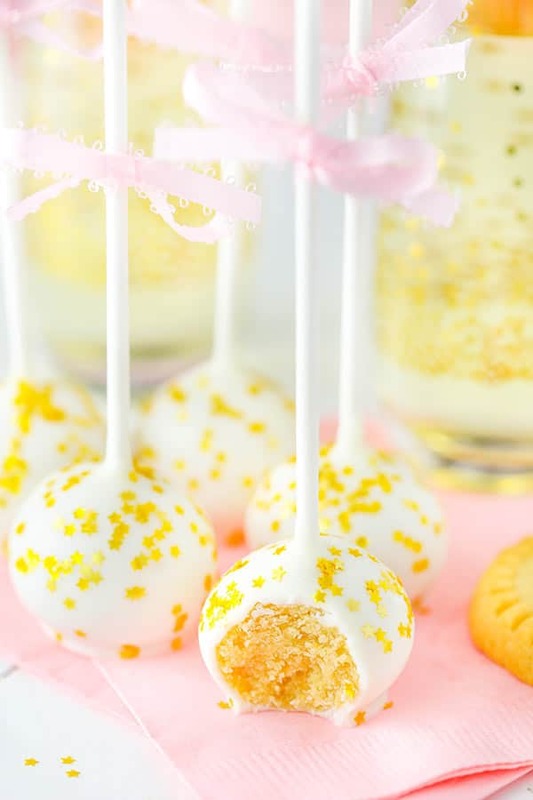 Dip the end of a lollipop stick into the melted candy and stick into the cookie ball. Repeat for each ball and let dry. 7. Dip each ball into the candy and tap off the excess. 8. Set on a piece of parchment paper to dry and add sprinkles. 9. Once dry, store pops in an air tight container. I used three full 5.3 oz boxes of Walkers Shortbread Rounds. This recipe can be cut in half. Is it possible to make withou champagne?? What I can add instead? You could use any other liquid, really. If you don’t want to add flavor, you can use water. hi, can i ignore the corn syrup? or any substitute to it? how do i keep it if my party is in the morning.can i do it and keep in fridge? The corn syrup helps hold everything together, so you can’t really leave it out. You could try using honey instead. I usually store these at room temperature in an air tight container. I really enjoy your sight Linsey. What is vanilla candy quick? It’s similar to almond bark. 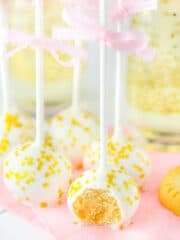 You could use any kind of vanilla candy coating or candy melts. Love your site!!! Trying to decide which desserts to make for my daughter’s wedding in June. Love all of your filled cupcake/cheesecake recipes, and was wondering if I could make them in mini tart pan or use the foil mini cupcake liners instead. Do you think this would work? Appreciate your input and any suggestions. Thanks Anita! So glad to hear that! Most cupcakes and cheesecakes should be fine made as mini versions. There may be certain recipes where you need more or less of a topping or something, but otherwise should be fine.